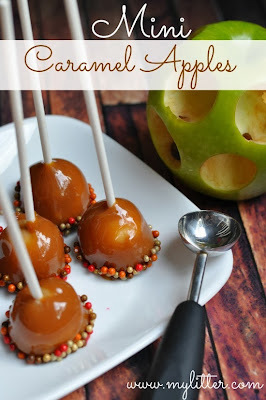 I would like to pop all those little caramel apples into my mouth right now...yum! One of my biggest pet peeves in making caramel apples (I honestly think I have done this only 1 time but still a big pet peeve from that 1 time...bahaha!) is that as you eat it the first round of apple is all that has the yummy delicious caramel. Well, have no fear I ran across these little nuggets of heaven and wanted to share so you can make them to so we can all be over that pet peeve. Is that how you spell "peeve," seems odd? So click here for a link to a gal's recipe (and great hints on how to make sure the caramel stays on the apples).